Latham’s CFIUS & US National Security lawyers draw on broad national security experience and senior government backgrounds to help clients navigate the sensitive and sometimes politically controversial CFIUS process. The Committee on Foreign Investment in the United States (CFIUS) evaluates the US national security impact of acquisitions of ‟control” by foreign persons of US businesses. Latham has a long track record of successfully navigating this process through early engagement by experienced practitioners with deep experience in all phases of the CFIUS process and related agency reviews, both as a general matter and on an industry sector basis. See a list of representative CFIUS Matters. No two situations are exactly alike, and the best course for the parties will vary from case to case. Latham's CFIUS advisors work alongside the firm’s M&A lawyers and subject matter and industry experts, producing efficiencies and strategic synergies in developing the most effective approaches for each transaction. Latham's CFIUS experts engage at the earliest stages of transaction planning to understand the characteristics of the parties, the industry and the transaction, as well as any potential sensitivities, to achieve the needed regulatory notices, clearances, or approvals. When useful in a particular transaction, the team also works closely with the parties’ financial, public relations, and other advisors (and/or help to form a deal-specific team) to create a holistic approach to clearance of the transaction. Members of the firm’s CFIUS & US National Security Practice team have held senior positions in the agencies that make up CFIUS and other US federal agencies, and several have had positions of responsibility directly related to CFIUS and/or security clearances. Latham’s Export Controls, Economic Sanctions & Customs practitioners provide critical support to Latham’s CFIUS & US National Security Practice. 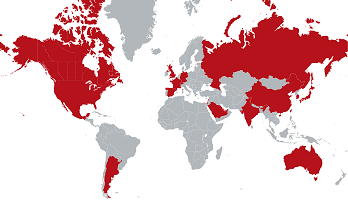 The team has represented US businesses and foreign investors in connection with CFIUS reviews relating to foreign investments from a broad range of countries, as shown on the map below. The range of transactions on which we have successfully advised clients concerning CFIUS and related issues demonstrates the depth of our firm’s experience and expertise involving foreign investors from all over the world, and the full range of US businesses and industries. Click here to read more about Latham's CFIUS & US National Security practice. Avago Technologies Limited – Representation of Avago Technologies Limited, a Singaporean semiconductor company, in its successful efforts to obtain CFIUS clearance in connection with their US$37 billion acquisition of Broadcom, a major manufacturer of telecommunications and networking equipment. EnergySolutions, Inc. – Representation of EnergySolutions, Inc., a US energy industry services provider, before CFIUS and the Department of Energy in connection with EnergySolutions’ sale of its Project, Products and Technology (PP&T) division to WS Atkins plc. Mattson Technologies, Inc. – Representation of Mattson Technologies, Inc., a US manufacturer of semiconductor tools, in its successful efforts to obtain CFIUS clearance in connection with its acquisition by E-Town Dragon, a Chinese investment group. Siemens AG – Representation of Siemens AG, a German multinational company, in its strategic acquisition of Dresser-Rand Group for US$7.8 billion, a supplier of custom-engineered rotating equipment solutions. As part of our broad representation, we successfully obtained CFIUS clearance for the transaction. Biotherapeutics Company – Representation before CFIUS in acquisition of a biopharmaceutical company. Canadian Pension Plan/European Private Equity Group – Representation of a large Canadian pension plan and a European private equity group before CFIUS and Team Telecom in connection with their joint acquisition of the fifth largest US cable operator. Communications Company – Representation of a communications company in their successful efforts to obtain CFIUS clearance in connection with its acquisition of a telecommunication network and internet service provider to financial institutions and governmental agencies in Latin America. Defense and Engineering Group – Representation of a defense and engineering group in their successful efforts to obtain CFIUS clearance in connection with its acquisition of a power wash business. Energy Company – Representation before CFIUS in acquisition of an enricher of uranium for nuclear power by a Japanese multinational conglomerate and a global energy and environmental technologies company via a PIPE transaction. Energy Company – Representation of an energy company in their successful efforts to obtain CFIUS clearance in connection with its acquisition by preference shareholders, one of which being an electronic manufacturer based in Tokyo, Japan. European Private Equity Firm – Representation of a European private equity firm in their successful efforts to obtain CFIUS clearance in connection with its acquisition of a satellite operator. Global Infrastructure Investment Firm – Representation before CFIUS in connection with US$1.43 billion sale of a 50% stake in the 680-mile Ruby pipeline to Veresen Inc., a Canadian energy infrastructure company. Identity Management and Detection Technology Company – Representation before CFIUS to obtain clearance for significant reinvestment in US identity management biometric company by private Arab country buyer. Inflatable Boat Manufacturer – Representation of an inflatable boat manufacturer in their successful efforts to obtain CFIUS clearance in connection with its sale to a European private equity fund. Internet Security Software Developer – Representation of an Israeli internet security software developer in their successful efforts to obtain CFIUS clearance in connection with its acquisition of an internet security company, including negotiation of the first agreement with CFIUS member agencies involving software development. Japanese Conglomerate – Representation of a Japanese conglomerate in their successful efforts to obtain CFIUS clearance in connection with its joint venture with a US energy firm to exploit opportunities for oil exploration and processing. Life Sciences Company – Representation before CFIUS in connection with sale of a life sciences company to a private Chinese buyer. Multinational Conglomerate – Representation of a multinational conglomerate in their successful efforts to obtain CFIUS clearance in connection with their acquisition of an Italian transportation company. Private Equity Firm – Representation before CFIUS in connection with the acquisition of a France-based manufacturer of photomultiplier tubes. Private Equity Firm – Representation of a private equity firm in their successful efforts to obtain CFIUS clearance in connection with their sale of an owner and operator of 15 power generation plants to a French-owned energy company. Renewable Energy Company – Representation of a renewable energy company in their successful efforts to obtain CFIUS clearance in connection with its sale of a 150-MW wind power project in Tehachapi, California. Singapore Government-Linked Company – Representation of a Singapore government-linked company in their successful efforts to obtain CFIUS clearance in connection with its acquisition of a US satellite-based broadband communications company. Spanish Energy Company – Representation of a Spanish energy company in their successful efforts to obtain CFIUS clearance in connection to a merger transaction between its subsidiary and an energy delivery company. Staffing Services Company – Representation of a Swiss provider of professional staffing services in their successful efforts to obtain CFIUS and Defense Security Service (DSS) clearance in connection with its acquisition of a provider of professional staffing services and the maintenance of security clearances at the various target companies. Submarine Cable Operator – Representation of a submarine capital operator in their successful efforts to obtain CFIUS clearance in connection with its sale to a Japanese telecommunications company. Sustainable Materials Company – Representation of a sustainable materials company in their efforts to obtain CFIUS clearance in connection with their acquisition by a Saudi Arabian oil company. Technology Company – Representation of a technology company in their successful efforts to obtain CFIUS clearance in connection with its acquisition of a semiconductor and software company. Telecommunications Company – Representation of a telecommunications company in their efforts to obtain CFIUS clearance in connection with their planned but not executed acquisition of a British telecommunications company. Telecommunications Company – Representation of an internet protocol-based telecommunications provider in their successful efforts to obtain CFIUS clearance and before Team Telecom agencies in connection with their merger with a telecommunications company. Telecommunications Investment Firm – Representation of a telecommunications investment firm in their successful efforts to obtain CFIUS clearance in connection with its acquisition of a communications provider. BTI names Ireland and Perry to elite “Client Service All-Stars” list.